Hello all! 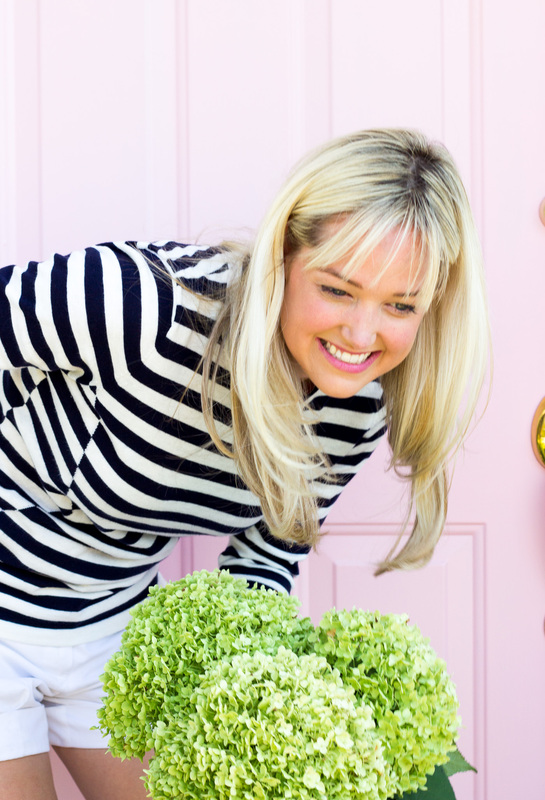 I am so excited to finally share our front door makeover with you! It’s truly one of my favorite paint projects ever. 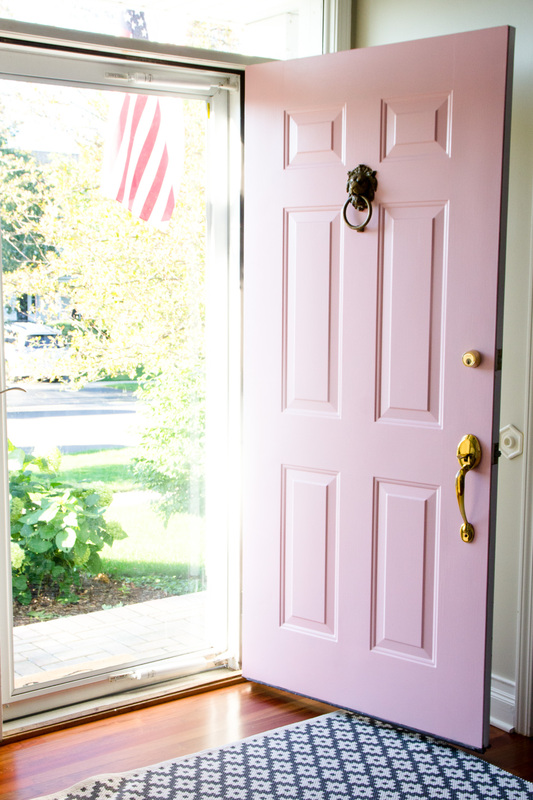 Even if pink is not for you, I promise this post will help you find the right color for your front door, why you should paint it and tips to get it right. 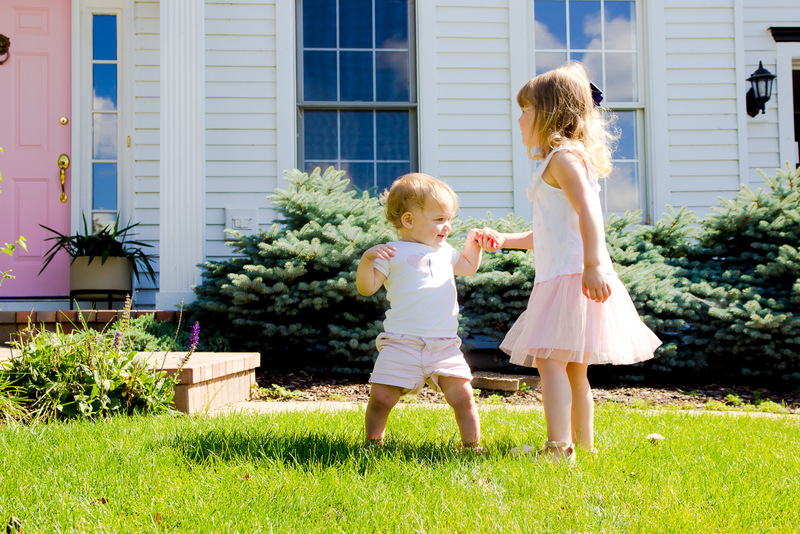 I believe the exterior of your house should reflect what’s inside. It’s the first thing your visitors see so why not make the best impression! 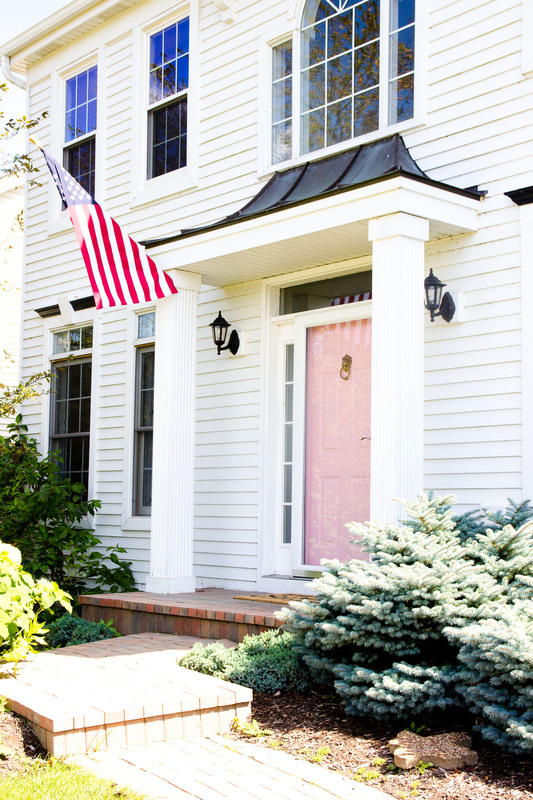 I love every time I pull up to our house and see our beautiful pink door. It just makes me so happy. And that’s what a home should do. 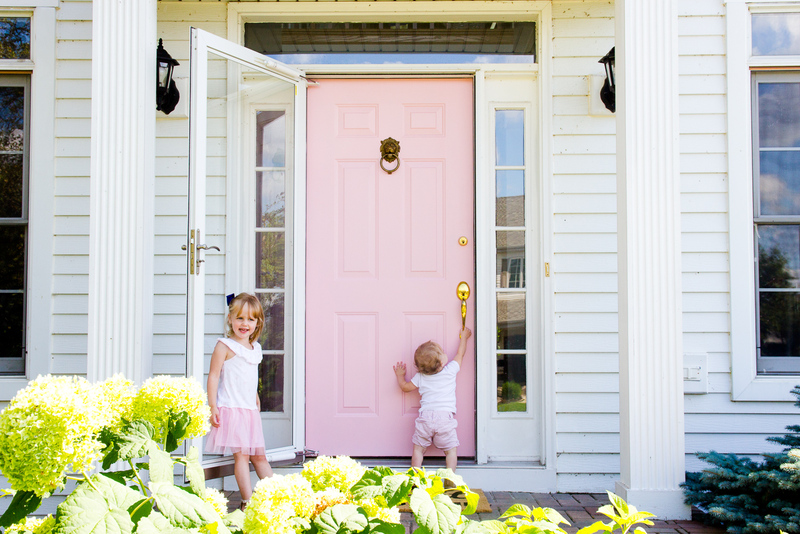 One of the easiest ways to give your house a fresh look and make it your own is by painting the front door. It’s easy, quick and a fairly inexpensive project. We have been making small changes to make our new house feel like our own and painting the front door definitely helped with that. 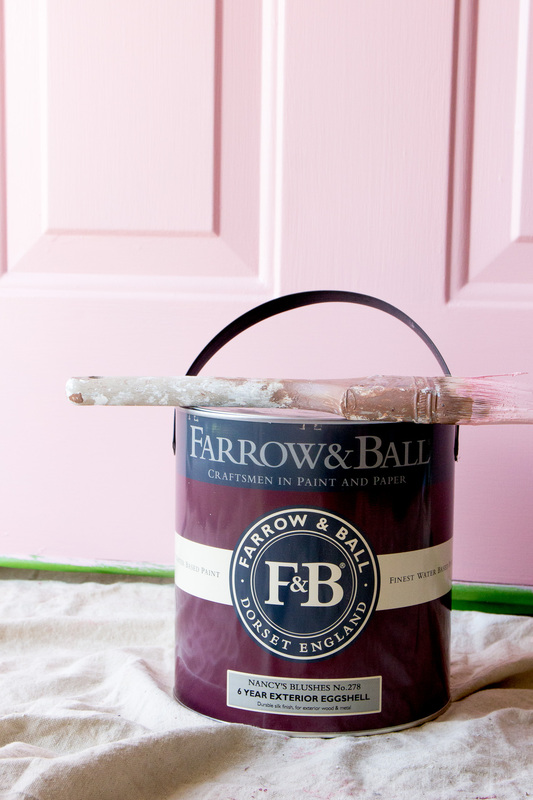 In case you missed it, I wrote about why I chose pink here but I wanted to elaborate a little too on why I chose Farrow & Ball paint. In that last post, I also included some of the inspiration photos and details on the samples we were looking at. I highly recommend using samples before you commit to a color. You’ve probably heard this before but colors can look so different on the computer and in the store. And they look much different indoors than outdoors. Morning and evening too. We tried 6 colors (with the cutest sample cans too). I thought Middleton Pink was going to be the winner for sure after seeing pictures online and even seeing a large sample at our local store. I was so wrong! 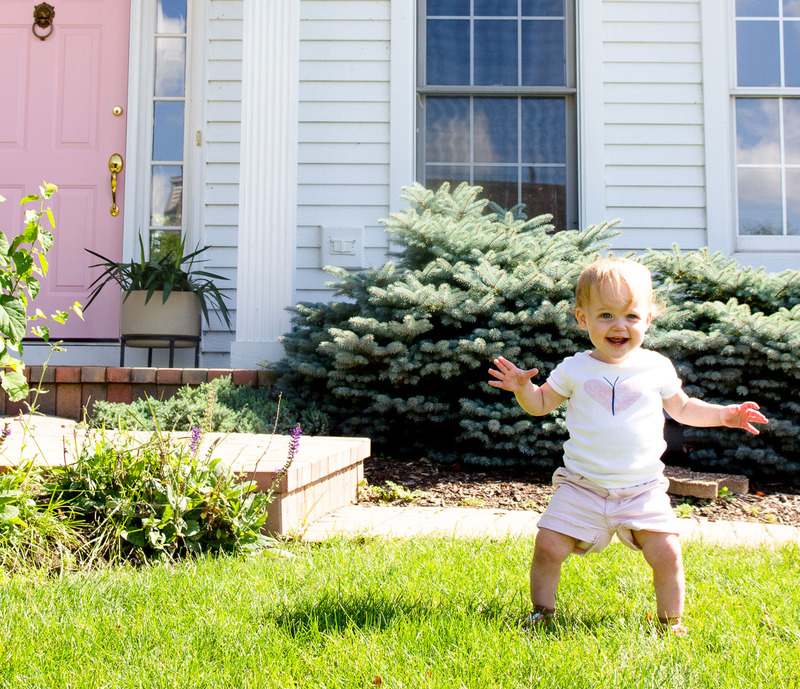 We tested it out on the front door and in person, but it was sooo much lighter than I thought. We ended up choosing Nancy’s Blushes, which I am so glad we went with!! Shockingly, Eric had the final say by the way 🙂 So happy he made this call!! The other contender was Cinder Rose which is a deeper pink and would have been beautiful as well (just not the “truest pink” like Nancy’s Blushes). 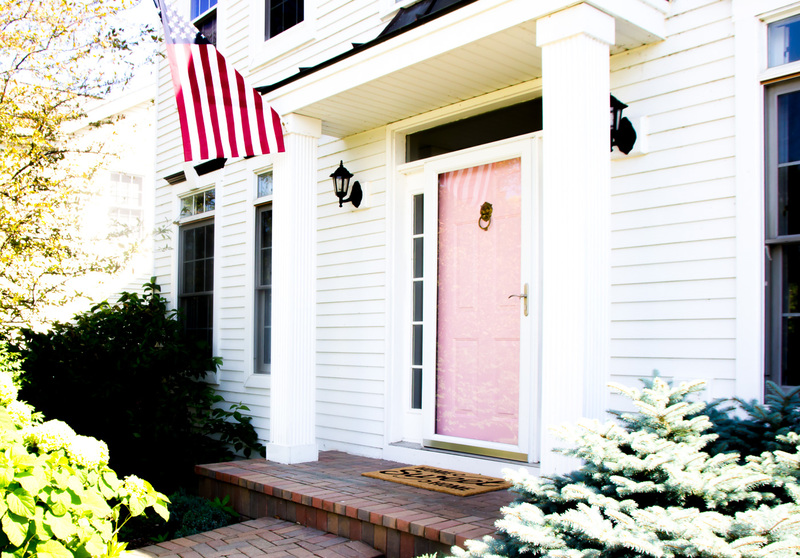 Middleton Pink was much too light for the front door, but since I loved the color so much, I decided to use it on the sides of the door. I had posted awhile ago about different ways to add little unexpected color into your home and one of the tips was to paint the inside of the door. It comes down to the PIGMENTATION. This is really what Farrow & Ball is known for. Their paint is highly pigmented, which means you are getting a rich color and quality coverage. Both of these are very important for any paint project, but especially when it comes to your front door. Farrow & Ball’s website has also becomes one of my tools I use as a designer. 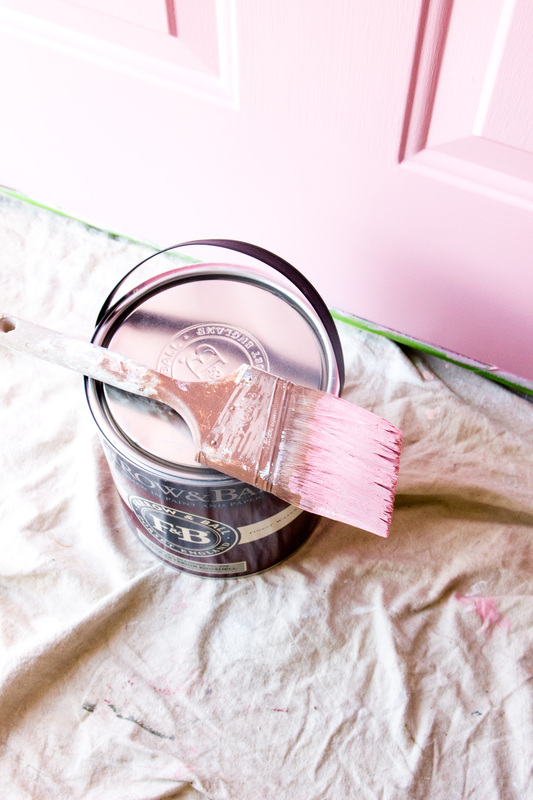 They have SO many great tips to offer from which paint brush should you use to how to use color in your home. I’m also kind of a nut when it comes to the materials and sources I use in our own home. I love that their paint is eco friendly and safe for the kids (even their cans are recyclable). We are also in most of these pics since we have a screen door and it just doesn’t photograph well with it closed. We thought about removing it but SO glad we didn’t! We keep the door open (locked of course) so often and I love how it lets more light inside. 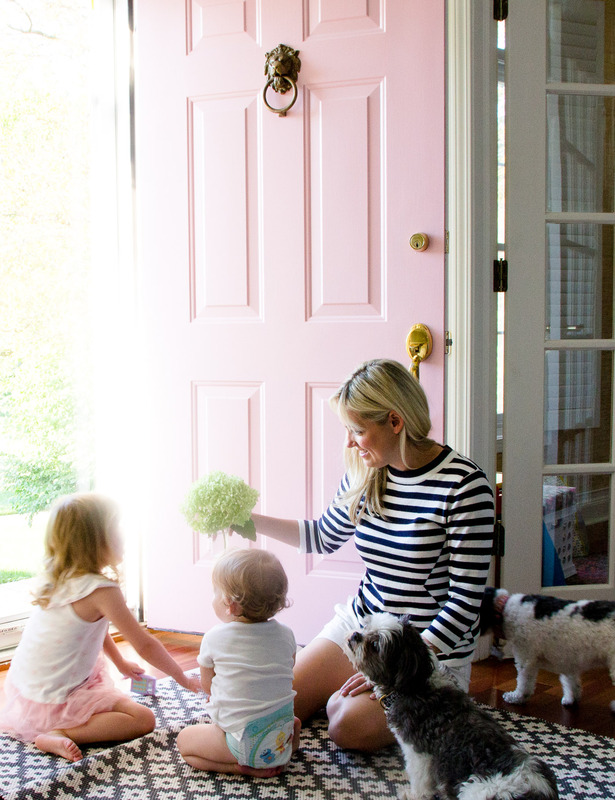 And then WE get to enjoy our pink door indoors too!! 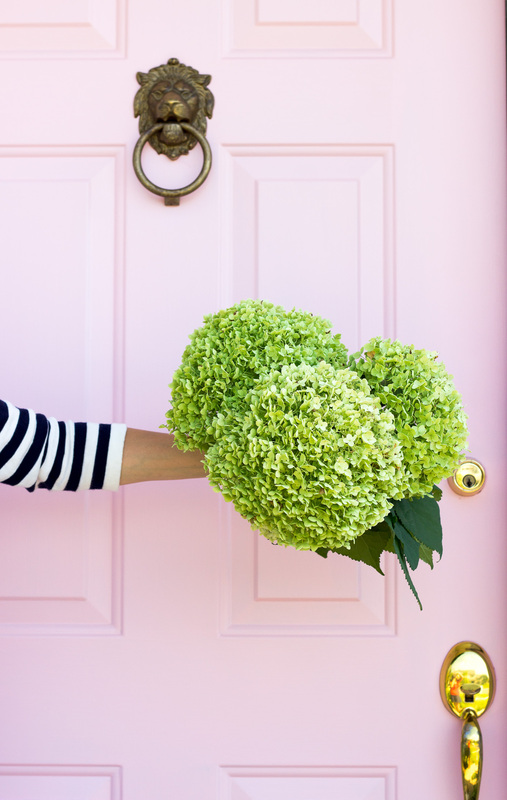 If you are in the mood for change but not sure which color to use, I loved reading this article about the meaning of colors for your front door. It’s so interesting! And may surprise you. 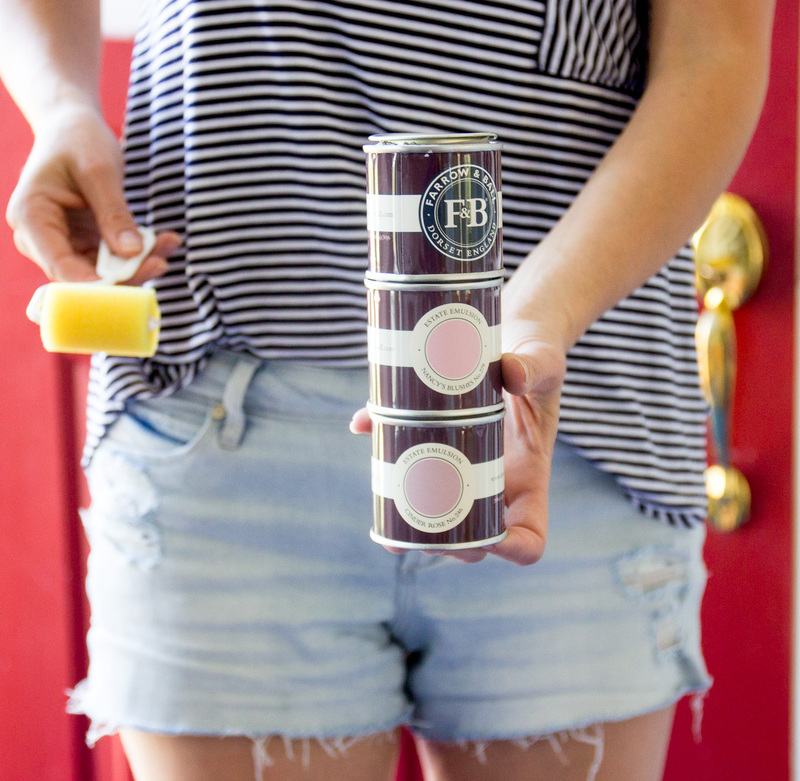 As soon as you decide on a color, choose from Farrow & Ball’s colour options (I promise you won’t be disappointed!). All of their colors are beautiful and were thoughtfully created. You also will not be overwhelmed with options! I’d love to hear which color you choose! Love this post! Would you recommend using Cinder Rose for a brick house with black shutters? Thanks Kelly! Cinder Rose would go beautifully with black shutters. Do you have a picture of your brick house you can send to me? Depending on which shade it is, it may or may not work well. My email address is samantha@shiningondesign.com. I look forward to hearing from you! Perfect color choice! Such a lovely home???? This is the prettiest door! I just love it. We are thinking about changing up our front door too and this is quite the inspiration! Hi! 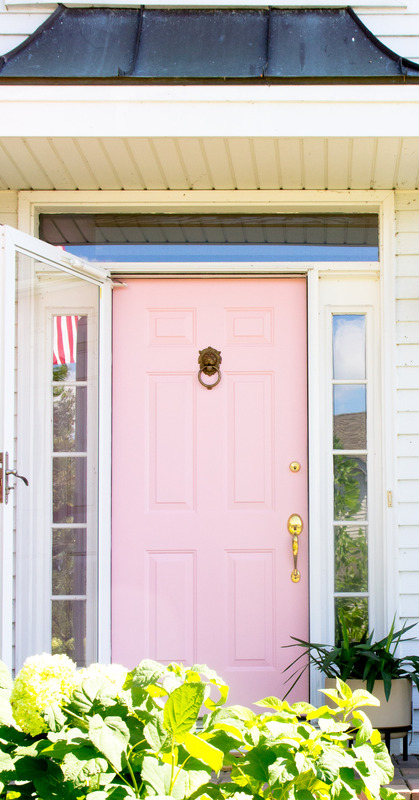 I can’t believe I just found this article on your pink door. I literally just painted my door this color and starting to second guess what I did. I am getting lots of feedback and it’s causing me to question my choice. Ugh! Your door looks beautiful with your White House. My house is an Iron gray with off white trim and Nancy blushes door. If I changed the color I don’t even know what to do. My ???? say pink but I am just not sure.